have you ever met a person you once met somewhere online at the internet? I've done it countless times and I absolutely love meet-ups with new and exciting people. Until now I guess I've met 20+ people so far and all of these people were really nice, loving human beings, not a single "disappointment" (like, that you don't "click" or cannot talk or anything.) My first blogger meet-up was with a girl named Tina. 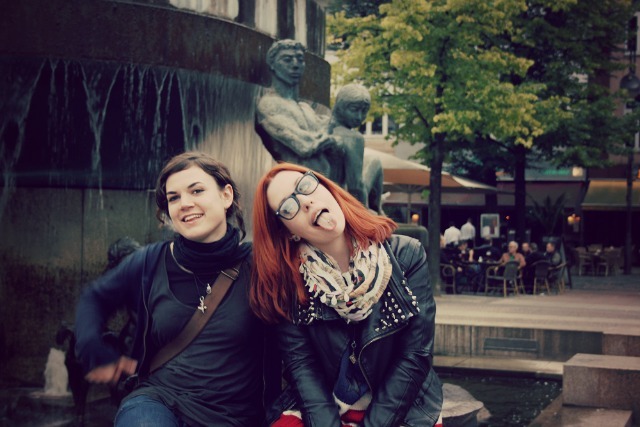 We are still friends for more than 8 years now and are meeting sometimes and her or my place since she doesn't live in Berlin. I love to meet new people; it's especially thrilling to meet people you found at the web because you never know how they'll turn out in real life. Me with Ria's glasses and Toni just being my silly self. I really enjoyed meeting these two cuties, I had a really fun afternoon! I'll definitely give Ria a call if I'm travelling again to her city since my good friend Tina I mentioned earlier in this post also lives at the same city. Have you ever met people you have known through the internet? I love meeting new people and altough it's a bit risky to meet people you've only known online so far, I couldn't tell a single negative experience, so just go for it! You would be surprised which kind of people are behind their online face :D If you're coming to Berlin or something, give me a call! Until then, have a nice day and enjoy the last days of summer!